I've been aware for sometime that there are some local country RV parks in the Inland Empire where we live. In the 24 years we have lived in Ontario we have never visited any of these parks....shame on us! Elaine and I decided we would take a drive this morning, New Year's Eve, and see three of them. The first was Rancho Jurupa Regional Park in Riverside, run by the County of Riverside: http://www.riversidecountyparks.org/locations/regional-parks/rancho_jurupa/ .What a pleasant surprise this park was. It is located along the west bank of the Santa Ana River, within eyeshot of Mt. Rubidoux. There are two separate campgrounds within the park...Lakeside and Cottontail. Lakeside is near the fishing lake, and Cottontail is a new addition with very large, paved sites, and surrounded by grass. These are the nicest spots, and run $35/day for full hookups including 50amp service. The Lakeside spots go for $25/ day. There is a laundry, and very nice restrooms. The second park we visited was Lake Elsinore Campground on the shores of Lake Elsinore. This park is actually owned by the city of Lake Elsinore: http://www.rockymountainrec.com/camp/elsinore-campground.htm . It is a little run down, but right on the shores of Lake Elsinore. Electric and water is $25 per day. There are no full hookup sites that I could see, but there may be. It is a very quiet park, and very close to services, and restaurants. There are a lot of trees, and palm trees specifically. Very quaint. This was one of the more level sites. Turn 180 degrees and you see the lake. The third park we visited was Prado Regional Park, run by the County of San Bernardino: http://www.co.san-bernardino.ca.us/parks/prado.htm . This park is less than 13 miles from our home, but it feels like you are a 1000 miles from anywhere. They have numerous 100+ foot pull through spots. The cost is $30 per night. If you are 62, or over, it is $25 per night. The pull through sites include a nice large concrete patio with fire pit, and a million dollar view. The million dollar view...and great patio! We will be returning, for sure, to Rancho Jurupa and Prado. Just goes to show you don't have to go far from home for a long weekend in the coach. There are a few other county parks we'll be visiting in the near future. Went mountain biking yesterday for the first time since the Labor Day weekend. 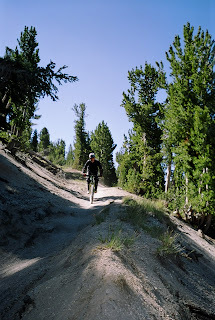 If you've been following this blog you will remember we spent a few days at Mt. Baldy RV Ranch over that holiday weekend. I did a short 6 mile ride (3 miles uphill, and 3 down) that morning hoping to return before our friend joined us in his Bluebird. As I neared the end of the 3 mile downhill run the realization that my left achilles tendon was hurting broke through the exhileration of the downhill run. When I stopped it felt like it was on fire.....uhoh, what's that all about? Well, it took almost 4 months for it to heal. Yesterday was the test to see if I could ride, and not hurt it again. After 17 miles of really strenuous uphill and downhill the verdict is in.....no pain yesterday, or today! Let me rephrase that....no pain in my achilles tendon...lol!! I had a lot of other pain (shoulders, neck, elbows) from the pounding downhill, but that's to be expected. My body is not used to the downhill, but it will be again. 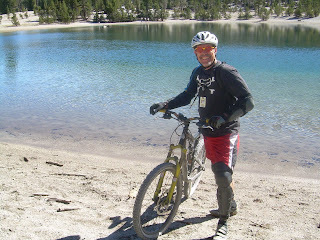 Mountain biking is one of the activities I use to stay fit. Usually if I am hurting it is self inflicted as in "I crashed". I really cannot point to any single thing I did to hurt it. I just remember it hurting one morning on our trip to Colorado in August. The pain would come and go, so I just wrote it off to stuff that starts hurting as you get older. Unfortunately, the ride on Labor Day weekend resulted in the pain becoming temporarily permanent, and resulted in me not being able to work out on my Stairmaster 4000pt, or mountain bike. The only thing I could do without hurting it more was run on the soccer field, so at least I was able to officiate soccer matches and retain some conditioning. Now the long process of regaining my mountain biking conditioning, now that I know I can use the Stairmaster, and ride without hurting myself again. We went with 1/2 a tree this year...lol! Wow....it seems like it was just 1999. Then we were entering a new century, so a new decade does not seem as dramatic, however, the passing of another decade renews the realization that time keeps going faster. I'm pretty sure the last decade was really only 6 years long....have I done some inadvertant thing to interrupt the "space time continuim"? One of our family traditions has been to see a movie Christmas afternoon. For the first time I took advantage of a "senior discount" yesterday to see the new Guy Ritchie Sherlock Holmes movie.....I saved 50 cents on each of our tickets! Yes, it was as good as I expected, but very intense. I can recommend it very highly. On the other hand, a new decade means my wife and I are much closer to our goal of retiring, and fulltiming in our Newell....20 months to go!! We had a very pleasant Christmas day.....all of the kids, and grandkids came for breakfast, and gift opening ceremonies. My oldest son gave me a set of wrenches to keep in the motorhome. These wrenches feature the ratcheting closed end....very cool! Today, December 26th, Elaine and I decided we needed some exercise, so we loaded up the Cannondale tandem and headed down to the SART (Santa Ana River Trail). There is an entrance at about 12.5 miles north of Newport Beach near Angel Stadium (the baseball Angels). We arrived at the starting point around 12:30pm. Normally on individual bikes it takes us about an hour and fifteen minutes to ride the 12.5 miles down to Newport Beach, but on the tandem we can average around 17 mph, so it takes us around 45-50 minutes to do the same distance. The return trip is uphill and our miles per hour average suffers a little. Repleat with our wired headsets...makes communication much easier! Giving our posteriors a break..about 24 miles into the ride. Total round trip ride time was 1 hour, 49 minutes....not bad for a couple of 60 year olds. The Cannondale Tandem.....like our Newell, we found this beauty on Craigslist! A short video for your enjoyment! 96% of Americans celebrate Christmas, whether, or not they are Christians, so I know this salutation will possibly only offend a few narcissists who occupy the 4% of the remaining population. As Spock so famously said near the end of The Wrath of Kahn, "....the needs of the few are outweighed by the needs of the many...". This is my favorite time of year....my attentnion is refocused on the meaning of this time of year and of life, things slow down at the office, and I am able to spend more time with family and friends. There is a sense of renewal and optimism in the air. Yes, even in spite of what I call "the religious left"and the fervor with which they are attempting to impose their religious belief upon a majority of the population who don't want what they are peddling. It takes an amazing act of faith for them to believe what they claim will be the outcome of their pending legislation. Especially when we examine the history of every single government program, and must acknowledge there is not one single instance, ever, of a government program saving money, reducing the deficit, and costing less than projected. The only way one could "believe" that the result of the Democrat healthcare/insurance reform will be a reduction in the deficit, reduction in healthcare costs, and the cost of health insurance is through an act of faith. There is no evidence whatsoever that any of what they believe will ever come to pass. The only thing the "evidence" and/or history shows us is the complete opposite result will occur. Nevertheless, I am optomistic for the future. This healthcare/insurance debate has brought the leftists out of the closet, and the majority of Americans see them, now, for what they are. The 2010 election cycle will provide the opportunity to undo what they have wrought. We may be heading out on the road later next month, but it will be a short trip, like up to Ventura with my brother, Philip, and his family. Sunday turned out to be sunny, so I began to tackle some of the cleaning. The last time I had opened the engine bay doors I was mortified at how dirty the bay areas had become over the course of this trip. Of course, when you are driving through snow, slush, and rain day after day it does get dirty inside, and out. I wish I had taken pictures of what it looked like before I started, but these pictures will give you an idea of what it looks like when it is clean. I, also, installed an additional reading light for the coach area that had come in the mail while we were gone. Integrity Mobile Detail will be coming to my home tomorrow morning to wash the exterior of the coach....they charge me $50 to wash and detail the exterior, and it takes them about 2 hours....it takes me most of the day....lol!! I was up before Elaine, as usual...about 6:30am.....the coffee was done brewing, and its seductive aroma drew me to the kitchen. The tide was quite high...waves were breaking just a few feet in front of the coach. I poured a cup of coffee, and sat down to gaze at the sullen gray skies swallowed up at the horizon by the Pacific Ocean. Well, today we will definitely make it home...although there are a couple of RV parks between us and home....but, seriously, we will arrive home today for sure. The diesel turned over easily and rumbled to life one more time....while the suspension system aired up to ride height I disconnected from the 50amp outlet one more time...the last time for a while. We eased out of site #22 at Faria Park, and climbed the short, steep hill to Rincon Parkway, and then south to merge with HWY 101 once again. As we approached cruising speed it began to rain.....it would rain every single mile home....fortunately the Saturday morning traffic was very light. We arrived home around Noon, and began to unpack in the rain......BUT it's 55 degrees....that's a heat wave for us!! The last 22 days on the road living in our motor coach were wonderful. I can say it now.....we had NO mechanical issues....not one single one in over 3,400 miles many of which were travelled in freezing temperatures, even when it was sunny. Tomorrow I will begin to scrub 3 weeks of road grime off the exterior of our moving home, while dreamig of the next "voyage". When I wake up tomorrow morning I will probably be a little disoriented, and wishing we were still on the road. The trip exceeded our expectations. We were concerened about weather on the Olympic Peninsuala, as well as the Oregon and California coasts, but were blessed to have 11 days of sunshine....who would have thought? Our decision to just make it up as we went worked out well....not one reservation was made. The only change we made was to continue going south past Crescent City on HWY 101, instead of northeast through Grants Pass over to HWY 395 and south along the eastern Sierra Nevada....we had had enough of snow, and sub freezing temperatures....although it was still cold along the California coast, it was pleasant and sunny, even it if was in the 40's most of the time. We left Pismo Beach around 9am and headed headed south on HWY 101, our last day on the road...about 248 miles to go. It rained on and off most of the night, but morning provided just heavy overcast, that is until I decided to dump the tanks one more time....then it started raining again...lol! The driving was mostly dry roads, and great views even with the heavy overcast. Around 11:30am we were approaching Rincon Parkway, just north of Ventura, CA and decided to exit to take a break, and make some sandwhiches, plus Elaine had a conference call in which she wanted to participate. While she started her conference call I walked down to Faria Park...a small county run RV park with full hookups....maybe a dozen sites right on the ocean....I mean 30 feet from the waves....I saw that there were about 8 spots open on a Friday....must be because of the weather. Elaine was just wrapping up her call when I got back.....I said...."you know, there really is no compelling reason why we have to be home on Friday....why not snag one of the open spots in Faria and spend the afternoon, and night?" Of course, she agreed, so we have stretched our trip 24 more hours. About the time we finished setting up it started raining, and I mean raining HARD.....it stopped about 30 minutes later and we had a little sun showing itself, so we took a walk north along the beach. "We're just stopping for a snack...."
Taking a walk while the sun is shinning! After our walk it began to rain again, and rained most of the night......it was great waking up during the night and hearing the rain on the roof.....very soothing. We spent a few hours reading, and hit the sack around 11pm......only 128 miles home! Well, our sunny disposition these past 11 days had a wet blanket thrown on it about 12:30pm today.....the rain started as we were exiting HWY 101 in Atascadero to have lunch at an In-&-Out Burger.....our first since the first day of our trip. It has continued to rain steadily, sometimes quite hard, and rains as I type this post at 4:30pm. We were planning to drive no further than San Luis Obispo, but the RV park options are quite limited in that fair city, so we pushed on another 15 miles to one of our favorite coastal cities, Pismo Beach, exiting at HWY 1 and pulling into the first RV park we came to, which ended up being Pismo Coast RV Village Resort, a little pricey at $44, but it's only money....LOL.....we are in a back-in spot right on the lagoon, with a view of the freakin' ocean...how great is that. ?...even with the rain....what a nice last evening in our moving home....we're sitting here listening to "rain on the roof", and watching the angry ocean pound the coastline just a few hundred yards away.....life is surely good! The drive south on HWY 101 was very pleasant....I really prefer travelling 101 as an alternatie to I-5. Easy driving. We'll have some more of the great Chili Elaine made a few days ago....it's been aging for 5 days, and then settle into a little light reading. Wednesday dawned clear, and cold....overnight temps got down to 29. About 11am I decided to get to cleaning the road grime off the bikes so we could take a ride through the wine country. When we finally started riding it was just 42 degrees, BUT the sun was out, which made it feel warmer....."honest, Honey, it does feel warmer than 42, doesn't it??" At any rate we headed off to Old Town Napa and found the visitor center. They provided us with an excellent map of all the wineries, and a second map of all the local bike paths, lanes, etc. We decided to head out Silverado Trail, north, and just stop in at a few wineries for some modest wine tasting. As we pedalled northward the clouds began to roll in, and the temperature began to drop. "Why can't I feel my toes?" This is a family owned winery, and they only sell over the internet...we sampled 6 wines......5 of which I personally thought were unique. We tasted 6 wines at Van der Heyden Vineyards Winery....Savignon Blanc, Chardonnay, Sirah, Rose, Cabernet Sagivnon, and a late harvest Cabernet Savignon. With the lone exception of the Cabernet, I loved the other 5. The late harvest Cab was almost like a Port, although unfortified. The Rose, really an early harvest Cab, was amazing. The Chardonnay had this surprising creamy aftertaste. This winery does not do retail sales through stores. They offer a wine club, which we will join. We also sampled 4 wines at this winery...I was not too impressed. After we finished our second wine tasting at Regusci Winery Elaine's toes were still numb from the cold...the temperature had dropped to 35 with the increasing cloud cover, so we turned back south to Napa Valley Expo RV Park.....about 10 miles back. We arrived back "home" around 4pm, and were very cold. Our total ride distance was around 20 miles.....with a little more sunshine we may have gone on, but, let's face it, wine tasting loses its luster when the temperatures get close to freezing and your mode of transporation is a bicycle....LOL! We were grateful for the much needed exercise. Only the second bike ride we have been able to take on this trip. Later, around 5:30, I put on our last 2 filets and my wife, the chef, made some zuccini, summer squash, and broccili....man, that woman can cook vegatables! Looking at the 10 day weather forecast I appeared that it would be raining on Thursday when we had planned to be in Napa, CA. So, instead of stopping in Willits, CA today, we pounded out 229 miles all the way to Napa, so tomorrow, Wednesday, it will be clear....we'll do some bike riding around old town, and do some wine tasting. We'll be here two days. We'll then head home on Thursday, a day early since it is forecast to rain so there is no point in still being here Thursday. We may break up the 450 mile home stretch into two days. The drive south on HWY 101 today was very pleasant.....mostly divided highway. It stayed cold all day, but is supposed to get into the 50's here in Napa tomorrow! We are staying at the Napa Valley Expo RV Park.....it's part of the County Fair complex....with our Good Sam discount it costs us $31 per day......full hookups, including 50amp. Elaine is making Fajitas for tonight's feast.....the sun has set, and life is good. We exited California on November 20th on our journey into the frozen tundra, and re-entered California today, December 7th....Pearl Harbor Day....the "Day of Infamy" always sneeks up on me. Thank you to all those servicemen past and present who dedicate their lives to keeping us safe, and enabling us to lead this amazing lifestyle! Brookings in search of fuel....this would be our last chance to get diesel under $3.00 for sometime. We pulled into a Chevron station on the southern edge of town and pumped 80 gallons of diesel at $2.79...best price since Idaho Falls. As soon as we crossed the border the price jumped to $3.09, so we saved $24.00! A few miles later we crossed back into California and immediately were directed into a border check station where we were asked if we had any "Christmas trees, or any other kinds of trees on board"...we saw that they had, indeed, confiscated a couple of Christmas trees......apprently it's against the law to smuggle the odd Christmas tree into Caifornia....the only contraband of any interest to the inspectors were the apples we had purchased in Aberdeen, WA, but since they were store bought, no problems. We stopped at the Safeway in Crescent City to stock up on a few supplies for the rest of the week, and were on our way within 30 minutes. Originally, we were only going as far as Arcata....about 103 miles, but after about 20 miles of narrow, windy road we were blessed with divided highway all the rest of the way to Eureka, and then again after Eureka, so we continued on to Fortuna, where we are now, courtesy of River Walk RV Park and Campground.....a very nice park, albeit a little "close"...free WiFi, and grass....sites could be a little more level, though. Our day was over before 2pm.......both of us needed to do some "work"...you know, that stuff that results in money being deposited into your checking account a couple of times a month. It is going to be cold here tonight....around 24 degrees.....yup, the block heater has been on since we docked. "red sky at night....sailor's delight"